Managing and delivering water for the environment involves careful planning among a range of people and organisations. Relationships between local communities, waterway managers (catchment management authorities and Melbourne Water), water storage managers, environmental water holders, land managers and scientists form the foundation of management of water for the environment. The Victorian environmental watering program involves the collaborative management of water available under environmental entitlements used to improve the health of rivers and wetlands and the native plants and animals that depend on them. The seasonal watering plan previews which rivers and wetlands will potentially receive water for the environment under the program in the coming year. The Victorian environmental watering program involves a range of people and organisations. Relationships between local communities, waterway managers, storage managers, environmental water holders and land managers form the foundation of the program. Many public authorities collaborate to deliver the program. These authorities are referred to as program partners. 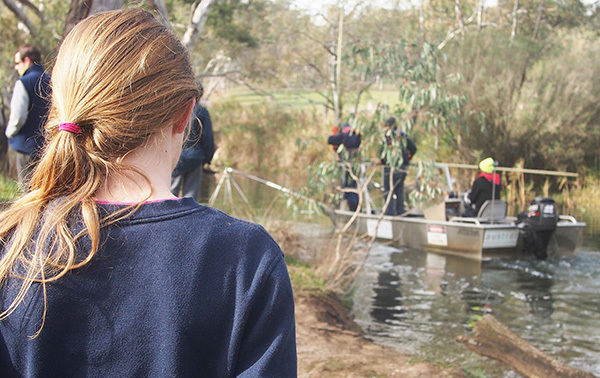 Waterway managers (catchment management authorities and Melbourne Water) are the cornerstone of the program. In consultation with local communities, they develop proposals for environmental watering in rivers and wetlands in their region. Waterway managers also order environmental water from storage managers and monitor the outcomes. Storage managers deliver water for all water users, including for waterway managers and environmental water holders. Water holders (like the Victorian Environmental Water Holder, the Commonwealth Environmental Water Holder and the Murray-Darling Basin Authority) commit environmental water to different rivers and wetlands. Water holders work together to ensure water delivered under different environmental entitlements is coordinated, and often have to prioritise across large regions (such as northern Victoria). Public land managers (such as Parks Victoria, Department of Environment, Land, Water and Planning, and Traditional Owner land management boards) are closely involved in environmental water planning and delivery for public land such as state forests or national parks. They may have responsibilities including controlling infrastructure (such as pumps, outlets, gates and channels) and organising public signage. To effectively manage environmental water, it's important we understand the environmental values of Victoria's rivers and wetlands. This understanding draws on the knowledge of local communities and scientists. Local communities help identify the important environmental values in their region and monitor the success of environmental watering. Their input is important because they are often involved with local rivers and wetlands and bring a range of environmental, cultural, social and economic perspectives to the program. Scientists provide indispensable advice about how environmental watering will support native plants and animals and work with waterway managers to monitor the results. Find out more about how we know environmental water works. Management of water for the environment involves a range of people and organisations, including local communities, waterway managers (catchment management authorities and Melbourne Water), storage managers (water corporations), environmental water holders, land managers and scientists. The management 'cycle' starts with scoping of potential environmental watering activities and environmental objectives in a particular region for that year. These potential activities are outlined in Seasonal Watering Proposals by regional waterway managers (catchment management authorities and Melbourne Water). We then prioritise where the finite amount of available water for the environment is best used across the state, and then deliver the water at the right time, and in the right amount, to meet our objectives. Current climatic and environmental conditions always influence decisions to deliver the water. Finally, reporting the results of the watering is a key component of the annual management cycle. Each year, waterway managers, generally involving local community representatives, develop seasonal watering proposals (which are informed by the priorities determined in the long-term plans and studies previously described). These proposals scope potential environmental watering actions (and associated environmental objectives) in a particular region for that year. They consider lessons learned through previous environmental watering. In these proposals, potential environmental watering is listed for a range of climate scenarios: drought, dry, average and wet to very wet. This is done to provide options depending on conditions and water availability during the year. As this figure shows, environmental watering objectives can change depending on the scenario. For example, in drought conditions, the objective is to protect remaining environmental values and avoid critical loss. In wet conditions, the objective is to reconnect rivers to floodplains. Every June, the Victoria Environmental Water Holder collates and summarises the seasonal watering proposals into a seasonal watering plan which previews all potential environmental watering across Victoria for the coming water year under each planning scenario. Sometimes the need for water for the environment is greater than the water available. It's therefore important to consider where water is most needed and how to use it efficiently to achieve the best results. Each year, these trade-offs are influenced by things such as how the river or wetland has been watered in the past, the risks in or near the river or wetland, and seasonal conditions. Unregulated flows: occur naturally in a waterway, generally after heavy rainfall, including when storages spill. Water for the environment: owned by environmental water holders, held in storages and actively released at a time and rate designed to provide environmental outcomes. Otherwise known as 'held' or 'managed' water for the environment. Consumptive water: owned by water corporations or private entitlement holders, held in storages and actively released to meet domestic, stock, town, industry and irrigation needs. System operating water: managed by storage (reservoir) managers, generally held in storages and actively released to ensure the system can deliver consumptive water, managed water for the environment and water to meet other needs. After prioritising, water is committed by environmental water holders for delivery to particular river reaches or wetlands. Where water needs to be released from a storage, the waterway manager responsible for that river or wetland places an order with the relevant storage manager. The order specifies the desired volume of water per day to be delivered through the river reach or into the wetland. Water is delivered in different ways depending on the river or wetland. Water can be released to a river from a storage or to a wetland through pumps, outlets, gates and channels. For wetlands, it can sometimes be as simple as opening a gate, allowing a river to flow into a wetland. For example, Dowd Morass in Gippsland can receive water for the environment when Latrobe River water levels reach a particular height. Storage managers are not only responsible for delivering water for the environment, they also release water for other purposes, including water to supply towns, industry and irrigation or system operating water to ensure the river has enough flow to be able to deliver environmental or consumptive water. Storage managers have a big responsibility to balance the needs of all water users. Deliveries of water for the environment, like deliveries for households and businesses, are managed to minimise risks such as flooding private land or 'double-booking' a channel for water delivery. Channels can get crowded. For example, when water for the environment is committed to Johnsons Swamp near Kerang, the timing of the delivery is organised so it doesn't conflict with the delivery of water to irrigators who rely on the same channels. Obviously heavy rain can meet environmental objectives, avoiding the need to release water for the environment. The timing and route for delivery of consumptive water can sometimes be changed to achieve environmental objectives without using water for the environment. Heavy rain (resulting in unregulated flows) can naturally meet an environmental objective, so water for the environment is not needed. Similarly, the timing and route for delivery of consumptive water can sometimes be altered to achieve environmental objectives without using water for the environment. Depending on how or where the water was delivered, storage managers or waterway managers report on the actual volumes of water delivered to a particular river reach or wetland. Water for the environment is 'debited from' the environmental entitlements held by the Victorian Environmental Water Holder. The benefits achieved from environmental watering and the lessons learned are reported by waterway managers and environmental water holders on their websites. Monitoring enables environmental water managers to report on what's been achieved. Find out more about how we know if environmental watering is successful. Water for the environment is not the only type of water that can support river, wetland and floodplain health. Waterway managers and environmental water holders, in consultation with storage managers, consider the potential for environmental watering objectives to be met by other types of water. Timing environmental releases can also be combined with other types of water to achieve greater benefits than an environmental release alone could produce. System operating water, including passing flows (water released from storages), maintains a baseflow - a stable, sustained or low flow - in many rivers to which water for the environment can be added. Heavy rainfall (resulting in unregulated flows) can naturally meet an environmental objective, so water available under environmental water entitlements is not needed. The timing and route for delivery of consumptive water can sometimes be altered to achieve environmental objectives without impacting consumptive water users. These types of water are considered in the development and implementation of the seasonal watering plan to ensure effective system operations and efficient use of water for the environment, and to achieve the maximum benefit to the environment. We also have the option of using return flows, carrying over and trading water. Some entitlements allow us to carry over unused water to the following financial year. This means that water allocated in one year can be kept in storages for use in the following year, subject to certain conditions. Carryover provides flexibility and enables water for the environment to be delivered at a time that is of the greatest value to the environment. For example, carryover can help ensure environmental water holders can meet high winter and spring demands when there is a risk there will be little water available under entitlements at the beginning of the water year. The Victorian Water Register has more information on carryover, including rules, FAQs and videos explaining what it is. Water trading allows us to move water to systems where and when it is most needed, and to smooth out some of the variability in water availability across systems and across years. Administrative water transfers are the most common trades we undertake. These occur between our entitlements (or accounts) to move water to where it is most needed. Other environmental water holders also transfer their water to us for delivery in Victoria. These types of water trades are often referred to as administrative transfers as there is no financial consideration associated with the trade. We can also buy or sell water allocation where it is in line with our statutory objectives: that is, if it benefits the environment. We have bought or sold a small amount of water allocation each year since we were established in 2011. Water has been purchased to enhance environmental outcomes in systems where there's not enough environmental water available, and it has been sold where all foreseeable environmental demands were able to be met. Revenue raised by selling water allocation can be used to purchase water to meet shortfalls in any Victorian system, or to invest in measures (such as monitoring, technical or small structural works, or other improvements to Victoria's environmental watering program). Subject to the approval of the Minister for Environment, Climate Change and Water, we can also trade our water entitlements, referred to as a permanent trade. However, permanent trades are infrequent. 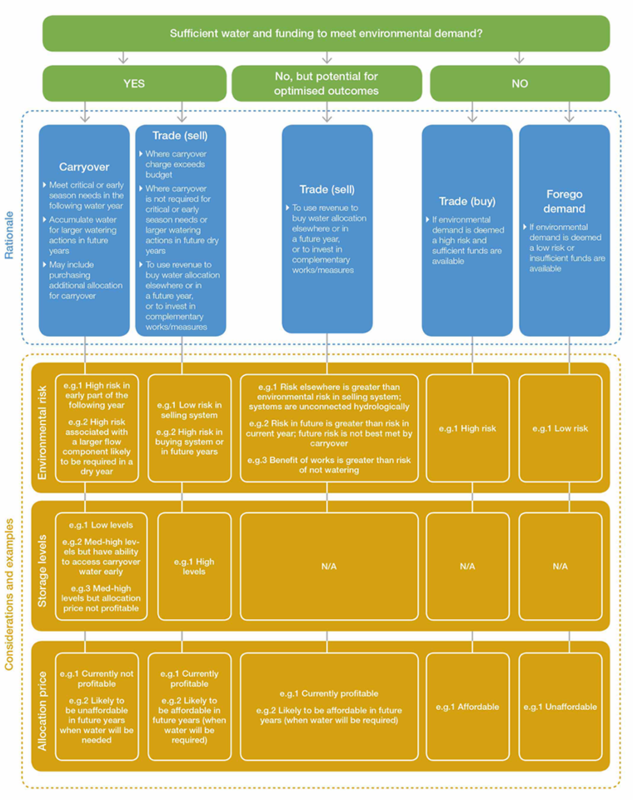 Below is a decision tree that shows what guides our carryover and trade decisions. Go to our page on trading for more information, see our trade fact sheet [PDF File - 968.1 KB], see our Annual water allocation trading strategy [PDF File - 392.3 KB] or visit the Victorian Water Register. In some systems, water for the environment delivered through upstream sites can be used again downstream. This helps to ensure water for the environment is used efficiently and effectively to achieve optimal environmental benefits, as the Goulburn River example below illustrates. This reuse policy, known as return flows, is available in many systems across northern Victoria. It increases the efficiency of water use and helps reduce the volume of water needed to be recovered for the environment from consumptive water users. Our access to return flows is enabled through rules in our environmental entitlements. Reuse of return flows is also available to the Commonwealth Environmental Water Holder and the Murray-Darling Basin Authority when we deliver water on their behalf. 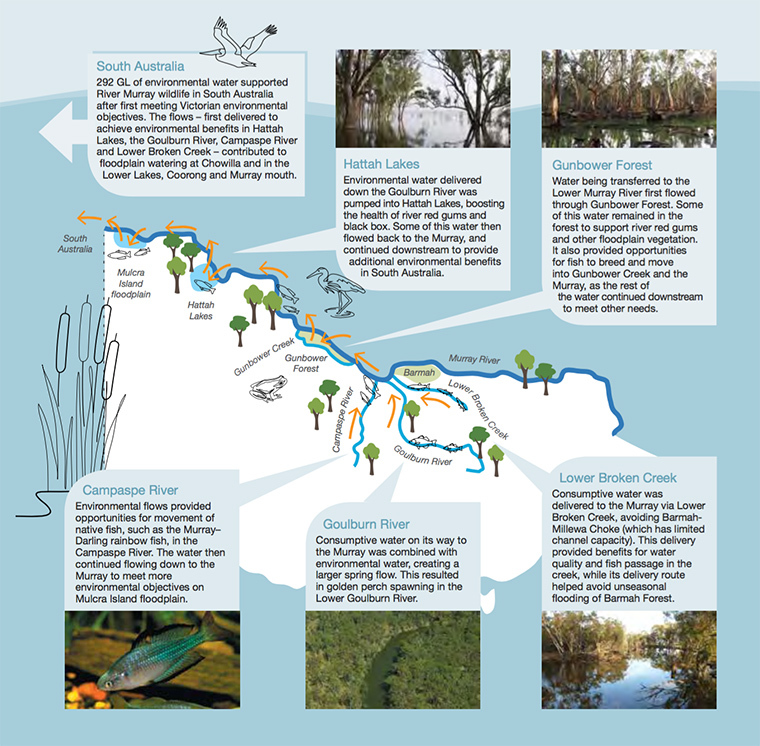 Where possible, return flows are reused to provide benefits at Victorian environmental sites. If not needed in Victoria, the Victorian Environmental Water Holder, Living Murray and Commonwealth Environmental Water Holder return flows will continue to flow across the border to South Australia, where they will be used to provide environmental benefits at sites such as the Coorong, Lower Lakes and Murray Mouth region. Combining environmental wand consumptive water releases to achieve greater results (for instance, environmental water 'piggybacking' on other water deliveries to achieve larger flows required to trigger fish breeding). Here are some examples of where these measures were able to be used to achieve efficient and effective environmental benefits in 2014-15. Managing risk is an important part of environmental watering. Regardless of their role or activity in the environmental watering program, each organisation involved carries risk. These risks are, to varying extents, shared by two or more partners. Just as environmental watering is not limited to organisational boundaries, neither are the risks associated with its management. The three main risks are unplanned impacts on third parties (such as property damage from high water levels), environmental outcomes not occuring (or cannot be shown) and unplanned negative impacts on the environment (for example, blackwater). A Risk Management Framework sets out a clear process for identifying and assessing risks, assignment of risk mitigation, and monitoring and review of risks. This framework is consistent with the Australian Standard for Risk Management (AS/NZS ISO 31000: 2009, Risk Management: Principles and Guidelines) and the Victorian Government Risk Management Framework. Identify and assess risks for the coming water year and record this in the seasonal watering proposals. Undertake agreed actions to minimise potential risks. Review risks before delivering water for the environment, or monitor and respond to risks when environmental conditions change and an action is triggered. Report, investigate and respond to incidents as they occur in line with the agreed incident reporting approach. Review the risk management approach in the previous year and adapt management to minimise future risks. Best-practice shared risk management continues to be a focus for the program. We continuously adapt and improve how we manage water for the environment. We learn by monitoring the effects of delivering water, from practical experience and through scientific research projects. The Victorian Environmental Water Holder invests in projects that improve knowledge, inform decisions and show the benefits of water for the environment. These projects are most commonly carried out by catchment management authorities in their region. Examples include animal and plant surveys which map-out environmental values in specific waterways and water quality monitoring, which helps us better respond to the impacts of drought. We also invest in innovative citizen science projects relating to environmental watering, such as the Western Victoria angler project. It helps anglers find out how the limited volumes of environmental water available is being used in the Wimmera and Glenelg rivers. This project is run by the Glenelg Hopkins Catchment Management Authority and the Wimmera Catchment Management Authority. Other projects help identify Aboriginal environmental outcomes for environmental watering. These projects help incorporate traditional ecological knowledge into environmental water management and assist Traditional Owners to negotiate for their Country's water needs. We also fund improvements to environmental water metering and infrastructure works in rivers and wetlands to improve efficiencies and to get more benefit from the same amount of water for the environment. For more information about research projects contact us.